I know now, though, that “made with real fruit” usually means that they stick a few drops of real fruit juice in there so that they can make that claim on the label, and then they add in a whole bunch of high fructose corn syrup and artificial colors and other fake stuff. Not exactly very healthy at all! Thankfully, for those of us who love our fruit snacks but don’t want all of the fake stuff, it’s possible to have homemade fruit snacks that are completely natural and even healthy! 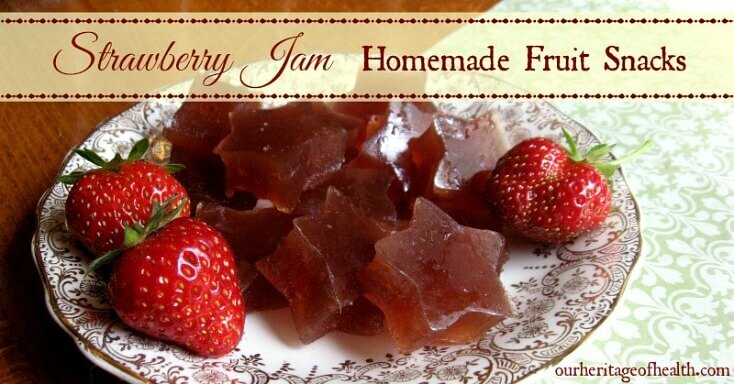 When you make homemade fruit snacks like these, you can use a jam made from whole fruit and natural sweeteners (like my new favorite strawberry maple jam for example) and protein-rich gelatin powder from grass-fed cows. Grass-fed gelatin is pretty amazing stuff really, and most of us don’t get enough of it anymore. (You can read more about the many health benefits of gelatin here.) Gelatin is great for hair, skin, nails, digestion, etc., but it’s not something most people eat a lot of, especially with our modern mentality of boneless, skinless meats. If you look back at earlier centuries, though, many people ate gelatin-rich foods every day, sometimes multiple times a day. If you page through a 19th century cookbook for example, you’ll find an abundance of recipes calling for homemade broth or stock made from gelatin-rich bones. Back in those days, they weren’t going to the grocery store and buying cellophane-wrapped packages of boneless, skinless chicken breasts. They used the whole animal, bones and all, eating the meat and the organs and saving the bones for making broth. For those times when you don’t have homemade broth on hand, though, using gelatin powder from healthy, pasture-raised animals is a great way to add some extra gelatin to your diet. And one of my favorite ways to do that is by making homemade fruit snacks! Fruit snacks are very simple to make too. I had thought making homemade fruit snacks would be time consuming and difficult, but it’s really very easy and fast. It took me less then 15 minutes to throw the ingredients together and then just a couple of hours in the fridge to chill. And that’s it! In a saucepan, combine strawberry jam, water, and gelatin. Stir or whisk together until all ingredients are well combined and there are no big clumps of gelatin powder left. Let the liquid cool for a few minutes and then pour into a glass 8×8 pan. Let the liquid cool some more until the pan is no longer hot to the touch (so it doesn’t crack when you put it into the cool fridge) and then place the pan in the fridge to set. This will probably take an hour or two depending on how cool the liquid was before you put it in. Note: Unless it’s the winter time and your house is cool, these store the best in the fridge. It’s been 90 degrees and humid here in MA for the past couple of days, and my fruit snacks started to get a little melty after I had left them out of the fridge for a couple of hours. They still tasted fine, but they didn’t have that nice firm fruit snack texture anymore. If you want to learn more about the health benefits of including gelatin in your diet and find out more ways to use it, a great book to check out is The Gelatin Secret. The Gelatin Secret covers everything you need to know about the little-known, forgotten superfood that was so common in the diets of our ancestors. This post is shared with: Sunday School at Butter Believer, Natural Living Monday at Natural Living Mamma, Clever Chicks Blog Hop at The Chicken Chick, Party Wave Wednesday at Holistic Squid, Frugal Days Sustainable Ways at Frugally Sustainable, Natural Living Link-Up at Jill’s Home Remedies. I am pinning this! 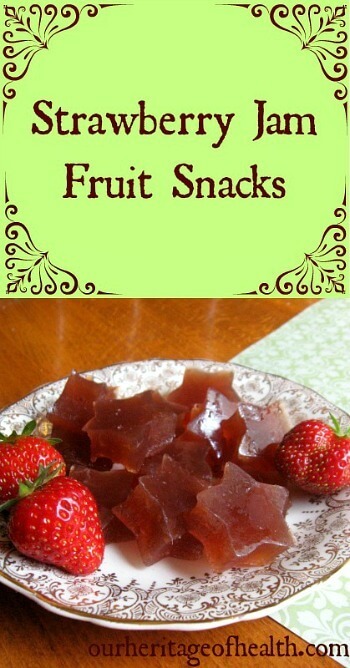 How fun and healthy to make your own fruit snacks! 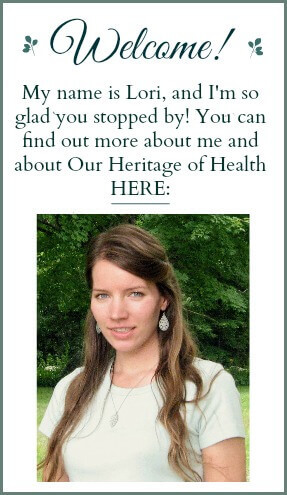 Visiting from Natural Living Link-up. Also pinning this and look forward to trying it! Pingback: Friday Happy Hour #53 - Oh Lardy!